H 36" x W 48" x D 4"
Gwendolyn Brooks coined the term Furious Flowers in the poem Second Sermon on the Warpland. When I think of Furious Flowers, I think of people who have appeared on earth to bring positive change, civility and culture to humanity. In 1963, Birmingham, Alabama became a battleground for activism and racial equality in the United States of America. This was the year four little girls, Denise McNair, Cynthia Wesley, Carole Robertson, and Addie Mae Collins, aged 11 to 14, gave their lives to help change the world for the better. This work is dedicated to them and to all of the Furious Flowers that have come after them and continue to bloom as agents of change. The same day these four little girls were murdered, two teenage boys, 13 years and 16 years, were also murdered in Birmingham, Alabama. We must not forget all of the beautiful flowers that have come to help mankind fulfill the promise of peace and happiness for all by "turning poison into medicine". 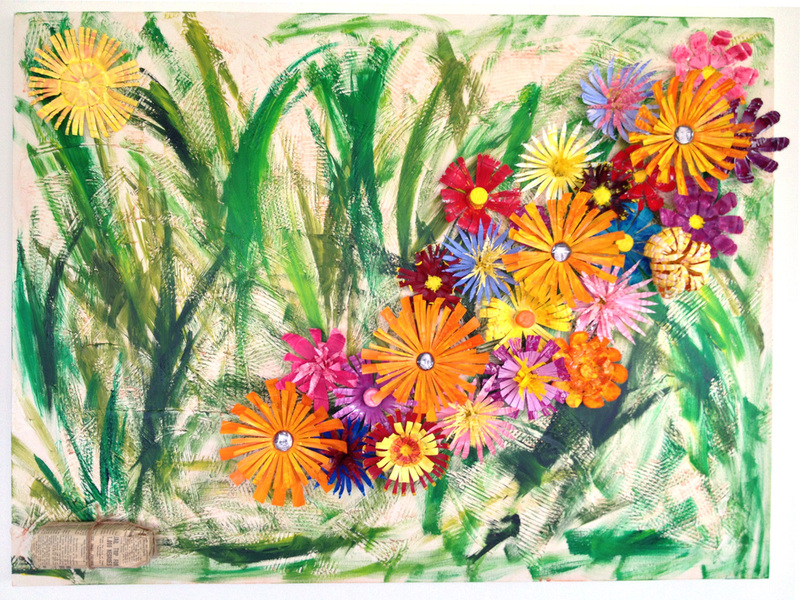 The flowers in this artwork are made from plastic drink bottles that have been upcycled into art. The representational bomb in the lower left corner is wrapped with an actual 1963 newspaper. The newspaper article wrapping the bomb details a march of over 1,000 elementary school children leaving school and the subsequent arrest and jailing of these children.